How tired is Vista, baby? The reason for this post has been triggered by me reading an excellent article by Dave Jewell called Vista – End of the Dream?. I encourage you to go read the whole thing but I particularly felt a lot of sympathy with his comments about maintainability of code. Ok puns aside, I don’t know how many of you have tangled with the ever-expanding beast that is Windows in its latest ‘shiny’ form. I was lucky enough to have access to a free copy of Vista through the Microsoft Academic Alliance program at my university. I’d tried running the Upgrade Wizard thingy to see how poorly my machine held up against these vastly updated hardware requirements. It did ok, apart from the graphics card which didn’t have the support it seems to do Aero, the new shiny desktop environment. If the hype about Aero is to be believed, then if Vista is mainly about Aero then a lot of people won’t be bothered to upgrade just for the sake of scrolling through windows at a jaunty angle. This is also in stark contrast to the latest versions of Ubuntu and RedHat 7 (due soon) which I’m sure would run on my PC hardware without so much of a squark, and without me needing to go to 3rd party manufacturers websites to see if my now-legacy hardware has Vista drivers. Personally, I’ve gone off Windows now I’ve been utterly smitten by Apple’s OS X. You really do look at Windows fan-boys rantings as a desperate attempt to carry on the momentum that got Microsoft by reaching world saturation levels with previously great products and now seem themselves to be undermining with Vista. My next PC purchase when my old XP machine falls over will no doubt be a Mac Pro (or whatever flavour we’re on then). I’ve got a properly registered copy of XP and Parallels virtualisation software if I feel the urge to dabble on the dark side. Having worked on trying to pick apart other designers code for a couple of years now, even me, as a developer who would’ve grunted and complained when the topic of documentation came up, can see the total and utter need for sensible commenting, layout and supporting design documents. “As you may remember, Windows XP was already out by the time that source code got leaked. In fact, back in 2004, Microsoft had been talking about Longhorn/Vista for three years. Just a few months after the leak, it was announced that WinFS, the flagship relational file system, wouldn’t ship with Vista after all. And I knew why: unmaintainable. It’s a good point. From lecturers telling me how many ways there are to call the same functionality in Windows, how rubbish it is at multi-threading, and from reading The Old New Thing, a blog from a Microsoft coding expert about the frustration of how much legacy support they’ve kept in Windows over the years (how they amended Windows 98 code just to make SimCity work) just proves how unmaintainable Windows is these days. There was talk about an internal project in Microsoft where a team was stripping the kernel bare and starting afresh. This surely needs to be given more priority, or are Microsoft going to take up Linux development and release their own flavour, binning their kernel as too complex? Posted on 29th April 2007 Categories Comment1 Comment on How tired is Vista, baby? In my quest to play with the macro feature on my digital camera, I became intregued with a large group of ladybirds who appeared in my garden a couple of years back. Ever since then, I’ve been interested in them. 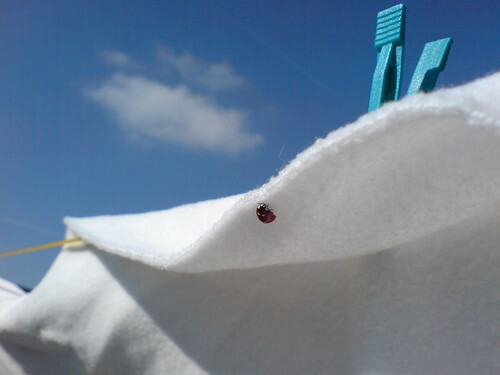 Recently I was hanging out this white fleece blanket on the line to dry and spotted that a friendly garden visitor had paused to take rest. The beauty of having a 3.2Mp Sony Ericsson K800i it enables you to grab quick shots like these when you’re not all ‘tooled up’ with the proper get up. Spring is most definitely here now at last and by the sounds of it, we’re in store for a heatwave this weekend. Roll on the summer! Well it all went a bit ‘Pete Tong’ two weeks ago when my server decided to get a few critical bad sectors on its main drive forcing a reinstall from scratch. In many ways its been a good process because for a while I’ve been wanting to upgrade the OS running on the box and to get it up to date. That’s looking on the bright side 🙂 One casualty has been my blog archives which I’m going to try and get back somehow, but in the meantime I thought I’d put something up more than the default text from WordPress. 7 weeks to go until my university career is over! (why I was about to type “for now” I’m not sure. Doubt I’ll be wanting to take four years out of my life again to do something this big, so this might be it finally). It’s time for the last push. Got a good boost today with a mark of 91% for a phase test which has really helped push up my average back over the mythical 70% barrier again. On track for a high mark and all to play for with still 70 credit points to attain. At least 30 of those are exams, just my final year project to get finished now before the start of May. And then it’s off into the unknown with my fiancée, Linz, which I really can’t wait for. Better get working so I can get a job! Whatever one of those is. Being a freeloading student does tend to cloud the mind to ‘reality’ but I’m looking forward to money moving in the other direction for a brief change. Posted on 12th April 2007 Categories Comment2 Comments on Hold!